Foal-Lac Pellets offer balanced protein and other essential nutrients for growth in foals. As a supplement to the foal's creep ration. 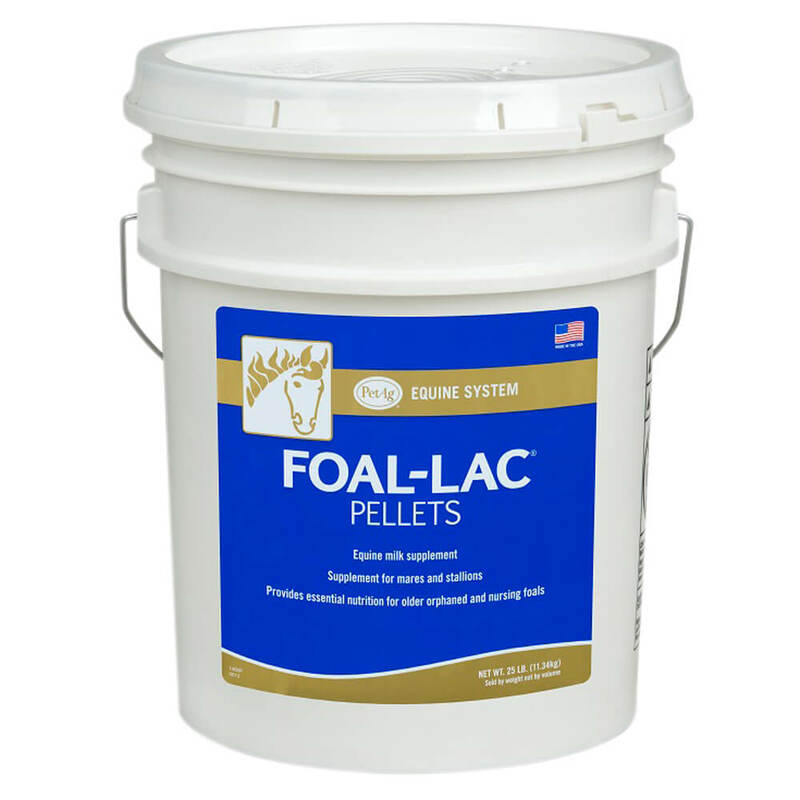 Foal-Lac Pellets provide milk nutrients to nursing foals at a time when the mare's milk declines in quantity and quality. Foal-Lac Pellets has been a valuable supplement for mares and foals for over 50 years. Foals: Feed up to 6 cups daily, mixed into 16% protein foal feed. Weanlings/Yearlings: Supplement 14% protein grain ration with 1-3 cups, depending on condition. Broodmares: Supplement ration with 1-3 cups, depending on condition during the last 3 months of gestation. Supplement ration with 3-6 cups daily during lactation. Breeding Stallions: Supplement ration with 1-3 cups daily during breeding season. Performance Horses: Supplement ration with 1-3 cups daily. Ingredients: Dried whey, soy flour, animal fat and vegetable fat (preserved with BHA and mixed tocopherols), dried skimmed milk, dried corn syrup, dicalcium phosphate, calcium carbonate, L-lysine, potassium chloride, DL-methionine, natural and artificial flavors, vitamin E supplement, magnesium sulfate, ferrous sulfate, manganese sulfate, vitamin A supplement, vitamin D3 supplement, copper sulfate, zinc sulfate,viramin B12 supplement, calcium pantothenate, niacin supplement, riboflavin supplement, thiamine mononitrate, folic acid, pyridoxine hydrochloride, ethylenediamine dihydroiodide, biotin, sodium selenite. Store in a cool, dry place. Not for human consumption.